The Darkness was supposed to die with the Black Wolf…but a more sinister truth is rising. 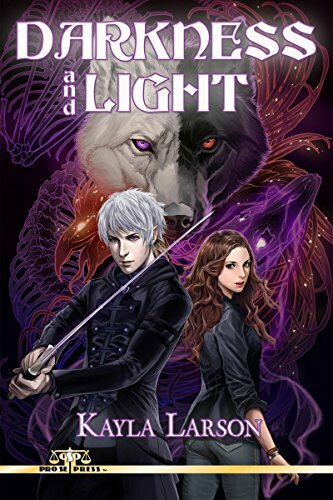 Author Kayla Larson returns readers to the world she created in her debut novel, WOLF WARRIORS, in DARKNESS AND LIGHT, the second book in the series. DARKNESS AND LIGHT by Kayla Larson. From Pro Se Productions. With a fantastic cover by Ashley Witter and logo design and print formatting by Marzia Marina and Antonino Lo Iacono, DARKNESS AND LIGHT is available now at Amazon at https://www.amazon.com/Darkness-Light-Kayla-Larson/dp/1973778688/ref=sr_1_1_twi_pap_2?ie=UTF8&qid=1500993737&sr=8-1&keywords=Darkness+and+Light+Larson and Pro Se’s own store at www.prose-press.com for 15.00. The second novel of this fantasy series is also available as an Ebook, designed and formatted by Lo Iacono and Marina for only $2.99 for the Kindle at https://www.amazon.com/Darkness-Light-Kayla-Larson-ebook/dp/B0745D16MV/ref=tmm_kin_swatch_0?_encoding=UTF8&qid=1500993737&sr=8-1. It is also available for free on Kindle Unlimited to Kindle Unlimited members. To learn more about Pro Se Productions, go to www.prose-press.com.Like Pro Se on Facebook at www.facebook.com/ProSeProductions. LITTLE WOODCUTTER, BIG ADVENTURE! YOUNGPULP SERIES-THE ADVENTURES OF PIERRE LOGBACK DEBUTS!